Published: Jun 29, 2017 to ? Ordinary office lady Azusa Aizawa died due to overwork. For that reason, when she finds herself reborn as an immortal witch with the appearance of a 17-year-old, she decides to live an easy-going life. Her main source of income is collecting magic stones that drop off the slimes that live in the nearby forest and selling them at the nearby village's guild. After doing this for the last 300 years, she's unknowingly become a level 99 witch, the most powerful of all. I have an interesting adventure trying to find this story. So for the longest time this didn't have any English translations with the only ones i'm able to find is the Raw's, Brazilian and some weird language i'v never heard of. I finally found it and i love it. It's nothing ground breaking or new. But it doesn't have to be. I find that the MC herself is more then enough for me to like this. The comedy is probably the best part of this. The very light heart tone it has works with the story well. I also like that it doesn't seem like it's gonna have the MC be swooning over any guys. Hell, From what i seen there are some Yuri undertones to the story. Fun and awesome story and the only thing i dislike is that we don't have more chapters out. I mean it's not particularly bad, it's just not very good either. So what I'm saying is you might enjoy this if you like cute-girls-doing-cute-things / moe-blob shows. > Knock knock on the door. > A X shows, lighty bothering Main-character-chan and demonstrating/announcing a problem to come. > Problem to come shows up and challenges mc to a battle. > Problem to come fails by herself (spoiler alert: no guys). > Turns out she's not a bad girl. > Pass time and repeat. At least this fits the theme. It's a somewhat-round-bubbly artstyle. Like slightly bubbly, but not enough to be particularly worth noting. But i am noting it here because there really isn't anything worth noting about it. It's nor good, nor bad. It's nor interesting, nor boring. It's nor detailed, nor minimalist. I could go on for a long time about what the artstyle isn't so i'm gonna stop. The character designs (and the world that's conveyed through them) are especially boring. Dragon girl is a normal dragon in her dragon form and a normal cute girl + horns (sticks?) in human form. Slime spirit girl has no trait reminiscent of slimes or spirits. Elf girl is a normal cute girl with somewhat pointy ears. and BEELZEBUB, THE LORD OF THE FLIES AND ONE OF THE ELDEST DEMONS OF THIS REALM is a normal cute girl with horns and slightly darker skin. Not even good horns too. Trust me, i know my horns. When they noted the title of LORD OF THE FLIES i was expectant, thinking this might turn out as an interesting character. Yeah, i know i'm naive. For the rest of world building, we haven't really gotten anything yet besides the start and character introduction, but i'm sure we'll get more as the manga goes further. Effortlessness. Now, now, that's not pejorative, let me just explain. The whole vibe of the manga turns around the idea that persistent, patient effort is much better both productivity-wise and health-wise than straining, rushed effort. And that is already conveyed expertly in countless ways throughout the mere 9 chapters. Gotta give praise where praise is due, in that aspect the manga is one step above most anime/manga. The problem here is that this theme turns into a double-edge. It's BECAUSE Azusa (just checked the mc's name) refuses to leave her home that problems come to show up at her doorstep (literally) and the very things that make this story bad are the embodiment of this general theme. Repetitive plotlines, boring art, unoriginal characters and world, it's like the author just filled in countless blanks with "meh, i'll figure it out later". Then again, "persistent, patient effort is much better both productivity-wise and health-wise than straining, rushed effort" so maybe it'll get better as it goes on. At chapter 31 i'll delete this review and write a new one. Or maybe I'm the problem, maybe I just can't get it because I'm an autistic NEET who hasn't worked a second of his life since he dropped out of high school 2 years ago. ¯\_(ツ)_/¯ . If you haven't read it yet i think "Kobayashi's dragon maid" is better (horn-wise included). If you have read it then i think you can read "While Killing Slimes for 300 Years, I Became the Max Level Unknowingly". Humanity will end in the next 20 years, so don't overwork yourselves, ok buddies? However, do not let that fool you to believe that this manga is all bad. ‘I’ve Been Killing Slimes for 300 Years and Maxes Out my Level’ is enjoyable throughout to read, even after the transition in theme, and I’m sure that if you enjoy family-oriented stories you will enjoy it much more than I did. Perhaps to some of you this change in theme is actually when the story got much better and more enjoyable and becomes a 9 or a 10 to you. For someone like me, who rates anime and manga bashing on a 5 being average, a 7 being very enjoyable, and a 10 for a masterpiece that I will remember forever, a 6 is not a poor score at all. I simply wish that they stuck with the initial theme and built from there. The manga simply just doesn’t stuck with what I believed it did incredibly well and instead followed a path it delivered more mediocrely on, which is the reason for my 6. 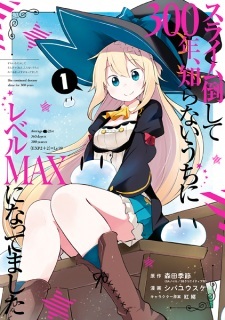 TLDR: The beginning of ‘I’ve Been Killing Slimes for 300 Years and Maxes Out my Level’ was based on the rebuilding of a life of a girl and her enjoying life to the fullest, and I really, really enjoyed this theme. However, the theme changed as the manga went on, and got progressively worse for me. Netherless this manga is still an enjoyable read, especially if you enjoy family-oriented themes.